Today I am experimenting with using non traditional colors for Christmas. One of my favorite color combinations is pink and black. I thought that might be a little too harsh for Christmas so instead of using black I used our basic gray to frame my pink tree. Notice how I used a hole punch on the tree so that the gray card stock would appear as little ornaments. I also added some jewel rhinestones and a bit of glimmer paper for the star cause I love my christmas creations to sparkle and shine! This combination was a happy accident, but I LOVE it. This card combines pistachio pudding, coastal cabana and soft slate. 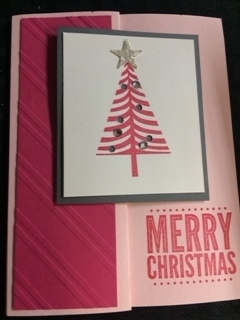 This card was created for my first card cafe class where participants got to choose which cards to make and this by far was the MOST popular card. This card is embellished with jewel rhinestones and pearls.